Download a print-friendly version of this lesson plan! Please share ... Free lesson plans are a great resource! 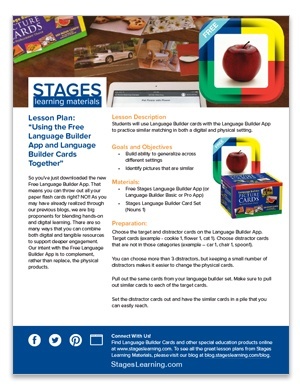 Students will use Language Builder cards with the Free Language Builder App to practice similar matching in both a digital and physical setting. Blend hands-on and digital learning to support a deeper learning engagement, while learning similar matching. Language Builder Picture Noun Cards.